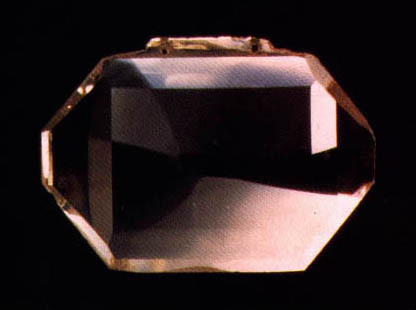 This table-cut or taviz diamond, measuring 44.6 × 33 × 3.6 mm and weighing 56.71 carats, is one of several that have been credited as a match for the Great Table Diamond viewed by Jean-Baptiste Tavernier at Golconda in 1642. However, the attribution is probably an error, the Darya-I-Nur, also a taviz cut, and the Nur-Ul-Ain diamonds in the Iranian Crown Jewels are much more likely matches. Nevertheless, the Shah Jahan Table Cut strongly resembles the diamond of octagonal outline in a turban ornament in a portrait of Shah Jahan, and the stone correlates reasonably well with a description by Tavernier of a table cut weighing 60 ratis (about 54 carats) shown to him by Aurangzeb, Shah Jahan's son, in 1665. Like other Mogul teasures, the table cut appears to have departed India with the Persian invasion in the mid-eighteenth century, after which it may have found its way into the Russian Treasury. The Shah Jahan was offered at auction by Christies in Geneva in 1985 but was not sold. The diamond exhibits a feature common in gems shaped for Mogul use, a pair of drilled holes by which a stone could be sewn to a turban or garment to impart both pomp and courtly fashion. Sources: Diamonds - Famous, Notable and Unique by GIA, The Nature of Diamonds by George E. Harlow.